Grateful thanks to Peter Cockburn for providing a number of scans for this chapter. ?1920s. Various designs, all measuring 16½ x 20 mm, inscribed ENTERTAINMENTS DUTY PAID. Perf 15 x 14. No watermark. Printed the FMS Survey Department. 1. The printer's imprint appears in the sheet margins. 2. The 50c is currently known only with REVENUE overprint (see R14 below). Note: in his 1978 book The Postage Stamps of Federated Malay States 1900-1935, Reeves records photographic essays for embossed / impressed revenue stamps in 12 different denominations ranging from 3c to $250. These were mounted together on a De La Rue archive sheet, each essay dated 23rd October 1911 and the sheet endorsed Engineers 13th February 1913. The De La Rue archive also contained undated proofs in orange on laid paper of embossed revenues denominated 3c and 4c. No examples of the issued stamps have been recorded to date, and it is possible that the essays were not in fact adopted. 1900-01. First provisional issue. 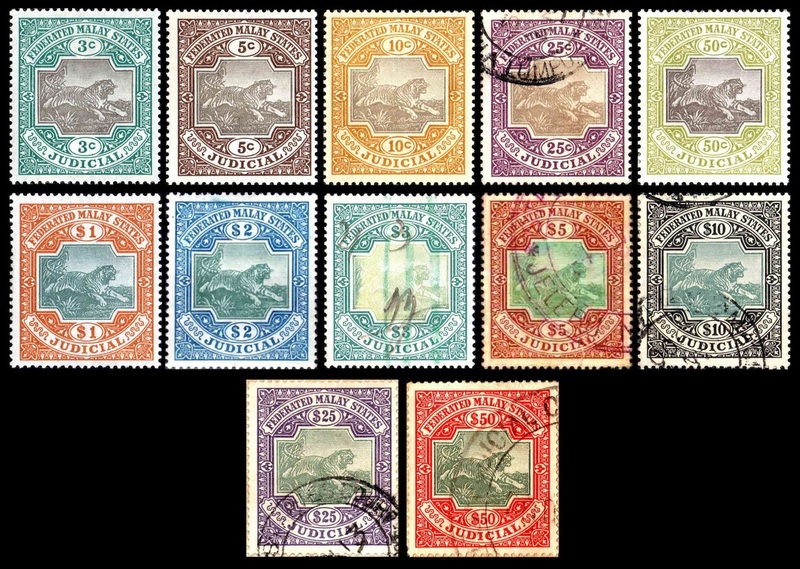 FMS postage and revenue issue of 1900 (tiger's head types of Negri Sembilan overprinted FEDERATED MALAY STATES) further overprinted for Judicial use, or surcharged also. 1. All recorded used examples of J1/6 are cancelled in Negri Sembilan, and it is possible that they were issued only in this state. 2. Recorded usage: J1 - Oct to Dec 1900, J2 - Jan 1901. 1900-04 (recorded usage). Provisional overprints on 1900-01 issue. Cents values in leaping tiger design, wmk Crown CA sideways; dollar values in elephant design, wmk Crown CC. Perf 14. 1. J11/13 are only known as mint stamps, and it is possible they were not issued. 2. J16 is known used only in Negri Sembilan, the one recorded example having a Sep 1901 cancel. 1. Proofs of all eight listed values can be found in the Crown Agents archive in the British Library, though the 10c and $25 values are not currently known as issued stamps. 2. Reeves (1978) records the 5c to 50c values on a De La Rue appendix sheet dated 13th March 1901 (Reqn 19/1901) and annotated Perak. 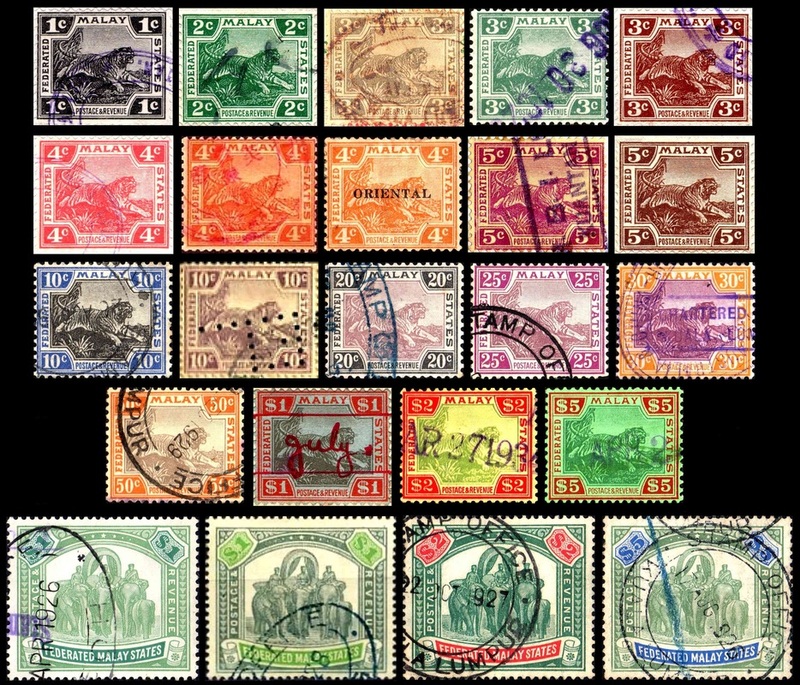 All recorded issued examples of this set are used in Perak, and it seems probable that the stamps were released in this state only. 3. Reeves (1989) records an entry in the De La Rue Private Day Book T/148 for the printing of FMS Judicial stamps, which almost certainly refers to this issue. The entry is dated 23rd May 1901 and gives the following print quantities: 5c (97 sheets), 10c (94 sheets), 20c (95 sheets), 50c (93 sheets), $1 (102 sheets), $2 (105 sheets), $5 (104 sheets), $25 (23 sheets). 4. Recorded usage: J23 - 1903, J24 - Oct 1902, J26 - May 1904. 1. Morley additionally records a 1c value similarly overprinted, and a 20c with double overprint in black and red. No-one else has recorded these and I believe Morley was transcribing an erroneous report of stamps he had not personally seen. 2. The double overprints in black and red on the 10c and 50c (J33a and J35a) seem to have been overprinted in black first and then had the red overprint applied subsequently, possibly because the black overprint was difficult to see. 3. J31/39 are normally found cancelled with the black double-ring Magistrate's Court type of Kuala Lumpur (more rarely of Kuala Kubu or Serendah), though to date J36, J38 and J39 have been recorded used only in Negri Sembilan with the double-ring oval of Magistrate's Court Seremban. 4. Recorded usage: J31 - Jul 1902, J32 - Apr 1902 to May 1903, J33 - Jul 1901, J33a - 1901, J34 - Apr 1901 to May 1903, J34a - May 1901, J35 - Apr 1901, J35a - Sep to Dec 1901, J36 - 1902, J37 - Feb to Jul 1902, J38 - Mar 1902, J39 - Mar 1902. 1. All FMS Judicial stamps issued from 1903 onwards were printed (typo) by De La Rue using their key plate technique. The vignette plate showed the iconic leaping tiger image used for the postage and revenue issues, and a new duty plate was introduced in vertical format, inscribed with the country name at the top and JUDICIAL at foot. The designed measured 25½ x 30 mm and was set in sheets of 60. 18 additional bi-coloured trials, 11 of them on coloured paper, on appendix sheet dated 29th July 1904, two of the trials annotated "Appd for 20c" and "For $100"
3. The first printings were printed on Crown CC watermarked paper. In due course this was replaced with Multiple Crown CA paper, and subsquently Multiple Script CA. 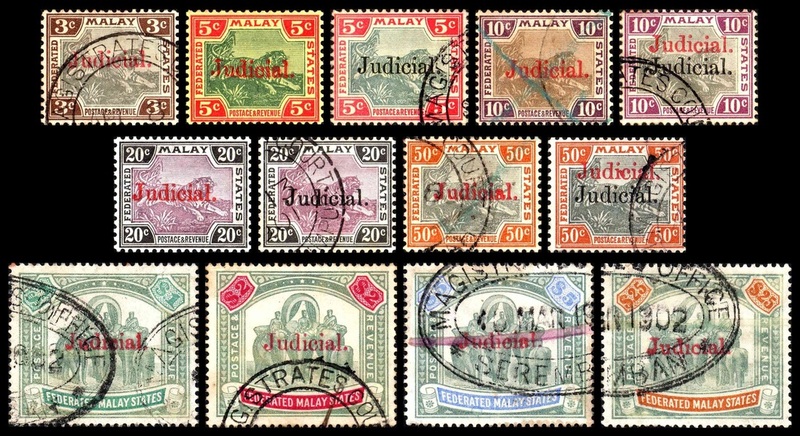 It is not known at what exact point the different watermarks were introduced, but comparison with other large-format De La Rue productions of the period suggests that Multiple Crown CA was used from roughly 1907 to early 1921, with 1903-06 printings on Crown CC paper and printings from late 1921 onwards on Script CA. If this is correct, then based on the available printing data (see schedule below), all values of the set should exist on all three watermarks except the 3c (CC and MCA only) and the $50 and $100 (CC only). 4. Printing data for all British Colonies stamp issues from February 1922 onwards are documented in the Crown Agents Requisition Books (now housed in the British Library). These plus the earlier printings of the FMS Judicials are listed by Reeves in his 1989 book Federated Malay States - The Printing of its stamps & postal stationery. Reeves does not number the printings or specify Requisition numbers, and does not indicate whether his dates refer to printing or dispatch. He does however include exact quantities printed for each value in each printing, which for reasons of space I have not reproduced here. 1903-06. New Judicial key type featuring leaping tiger (as on postage and revenue issues) but in a vertical format frame, 25½ x 30 mm. Wmk Crown CC. Perf 14. Printed (typo) by De La Rue. 1. The 20c and $100 values are known from the printers' archive material and requisition records, but I have not seen either of these as issued stamps. The existence of several documents bearing large multiples of the $50 value has led some specialists to suppose that the 17 sheets of the $100 sent to Malaya in 1906 were in fact never issued. 2. Some shade variation can be found on many values of this series as well as J61/86. The green centres of the $1 to $50 can sometimes appear grey due to washing or fading. 3. Tan lists a $25 red and green and a $25 green and orange, the latter also being listed by Forbin. I believe these are errors, though they may refer to the third of the three DLR essays for this issue, which was denominated $25 and printed in green and orange (see General notes on the Judicial key type issues, note 2). 4. An example of the $25 with sans-serif SPECIMEN handstamp (Samuels type D9a) was sold in the 1997 auction of the Malaya Study Group. 5. An example of the 50c with a cancel dated 1900 was described in the 1997 auction catalogue of the Malaya Study Group (lot 42). It is possible that the cancel was set with the wrong year plug since the print records clearly point to an issue date no earlier than 1903. 1907-31. As previous issue but change of watermark. 1. The existence of the stamps in brackets is known from the Crown Agents Requisition books but I have not seen them as issued stamps. 2. Some of the MCA printings and all the Script printings of J61/86 seem to be on chalk-surfaced paper. 1916. Arms of the Federated Malay States on banner over war orphans and widows. 27 x 45 mm. Shields in corners each bearing the name of one member state of the FMS. Rough perf 12. No watermark. No value indicated. The inscription at foot differs between the four types. Note: according to The Postage Stamps of the Federated Malay States by W A Reeves, the above stamps were issued on 17th February 1916 and withdrawn in 1918. All cancelled examples I have seen are dated within this period. 1918-33 (see note 1). Typeset values printed on a range of coloured papers, 37 x 23 mm. No watermark. Rough perf 12. Unique security number printed on each stamp. 1. C L Harte-Lovelace first recorded these stamps in the February 1919 edition of the Bulletin of the Fiscal Philatelic Society. He lists only five values (1c, 2c, 4c, 7c, 10c) and states that the issue date was 1st January 1918, though the source of his information is not given. The 5c, 20c and 30c were presumably added to the series later, and have the inscriptions in a slightly different font from the original five values. The latest identifiable cancel hitherto found on this issue is dated 1933. 2. A wide range of minor varieties may be found due to inconsistencies within the sheet. 3. Tan also lists 9c, 13c and 15c values for the above set. I have not seen these, and suspect Tan has confused them with the later Malayan Railway series, which does include the 9c and 15c values. ?1930s. New typeset design in wider horizontal format, inscribed F.M.S.R. at each side. In 1948 the FMS Railway was renamed the Malayan Railway Administration, which in turn became Keretapi Tanah Melayu on Malaysia's independence in 1962. Newspaper stamps issued under these names are listed on the BMA / Federation / Malaysia page. 1910-20. Elephants key type, 30 x 25½ mm, as used for postage and revenue high values but inscribed REVENUE at both sides. Wmk Multiple Crown CA (sideways). Perf 14. Printed (typo) by De La Rue in sheets of 30. 1. Reeves (1978) records the existence of cut-down die proofs of the $100 and $250 duty tablets, affixed to a piece dated 27th October 1910. 2. The $100 wmk upright was discovered by Peter Cockburn. His example (sold by Spink Singapore in September 2014) is cancelled 1925, which indicates that this came from the 1920 printing. It is not known which of the $250 reprints (see list below) was the first with upright watermark, but it must have been 1920 at the latest. 1926-35. As previous issue but watermark Multiple Script CA (sideways on $100). Note: Tan states that the watermark can be found both upright on sideways on both values, which is correct for the MCA issues (R1/2a) but not in my view for the Script printings. There was only one Script CA printing of the $100 so it seems unlikely that two different watermark orientations would exist. I have not seen the $250 with Script wmk sideways. c1930. Entertainments Duty issue overprinted REVENUE in black or (R12) surcharged REVENUE 6 diagonally in red. 1. The 50c has not been recorded without REVENUE overprint. 2. Tan additionally lists the 20c and 30c values overprinted Revenue but I believe this is an erroneously listing for the unoverprinted stamps. 1900. Tiger's head types of Negri Sembilan (cents values) or elephants type of Perak (dollar values) overprinted FEDERATED MALAY STATES with bar through original state name. Perf 14. Wmk Crown CA (cents values) or Crown CC (dollar values). Printed and overprinted (typo) by De La Rue. 1900-01. Cents values in leaping tiger design, wmk Crown CA sideways; dollar values in elephant design, wmk Crown CC. Perf 14. Printed (typo) by De La Rue. 1904-22. As previous issue but watermark changed to Multiple Crown CA (sideways on cents values). Perf 14. Printed (typo) by De La Rue. Ordinary paper (1c to 50c) or chalk-surfaced paper (dollar values). 1922-34. As previous issue but watermark changed to Multiple Script CA (sideways on leaping tiger types). Perf 14. Printed (typo) by De La Rue. Ordinary paper (1c to 10c black and blue) or chalk-surfaced paper (10c purple on pale yellow and 20c to $25).